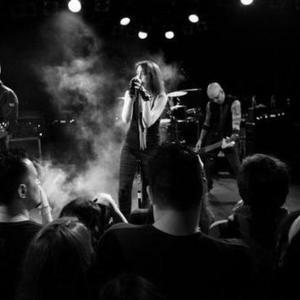 Kidneythieves are an industrial rock band led by Free Dominguez (vocals) and Bruce Somers (guitar/engineering). They formed the band in Los Angeles, in 1997, and along the way they picked up other band members such as Chris Schleyer (guitar), Christian Dorris (bass), and Sean Sellers (drum). Their lyrics are heavily influenced by psychology, particularly Jung. The band have released four studio albums, "Trickster" (1998), "Zer&oslash;space" (2002), and "Trypt0fanatic" (2010). An EP "The Invisible Plan" (2011). And a remix EP "Phi in the Sky" (2001), released in between "Trickster" & "Zer?space". The band have released four studio albums, "Trickster" (1998), "Zer&oslash;space" (2002), and "Trypt0fanatic" (2010). An EP "The Invisible Plan" (2011). And a remix EP "Phi in the Sky" (2001), released in between "Trickster" & "Zer?space". The band re-released "Trickster" as "Trickstereprocess" in 2004, which included 5 new bonus tracks, along with a bonus DVD. After the release of "Trickstereprocess", the group called it quits and went their separate ways. Free Dominguez went on to create an indie project while Bruce Somers created the band Shocknina. In January of 2007, Free Dominguez sent out a newsletter via email stating that she and Bruce are collaborating once again on brand new Kidneythieves material. These sessions resulted in the brand new album "Tryptofanatic". Kidneythieves have hired bassist Mirv Douglas and are working on their new EP "The Invisible Plan" to be released in October 2011.